There are few crops in my garden that I fuss over as much as I do strawberries. If I give them the care they need, they give me berries. They are quite straightforward about it -- no attention, no berries. It is an honest and open barter. Many of the following articles first appeared in "Countryside Magazine" in years past. For a more current discussion and info check out my "Growing Berries for Food and Fun" book which includes strawberries, raspberries, blueberries and grapes, published in 2016. A few years ago I planted a new variety in my strawberry bed, Annapolis, and this year was the first real crop. It's doing well and surprised me with very large fruit. I haven't been overly fond of the real large berries I've tried in the past but Annapolis has decent flavor. And as a plus it's a firm berry so is easy to slice for the dryer. It's also not overly juicy, unlike my other two varieties (Old North Sea and Dunlap). I like having the Annapolis to dry and the others for fresh (and canned) sauce. The berries are getting smaller as the season progresses but still a good size. They're ripening during an abnormally hot time so they may act different in a more normal (if there is such a thing!) cooler year. The season may be short because of the heat but so far the plants are producing well and we thoroughly them. The last two years I seriously renovated the Dunlap patch by removing ALL poorly plants, leaving a rather small contingent to repopulate the area. This is always a bit worrisome knowing I can't just go out and buy new plants if it doesn't work. The same is true for the Old North Sea. Both patches started about 25 years ago with a small sample from Seed Saver Exchange members; I've been growing and enjoying them in my garden since. The Dunlaps responded happily with the best harvest I've had in many years. They have wonderfully tasting sweet, soft fruit that pulls off the hull when fully ripe when picking. For the home grower this is great (easy to go straight into your mouth!) but it wouldn't do for commercial growers which is likely a big reason this variety is no longer available. Many years ago, maybe twenty, I got some strawberry plants from a Seed Savers Exchange member that they called "Old North Sea". It was an old variety, grows close to the ground with its fruit low, safer from birds and cold. A real nice sweet everbearer of variable size it's been my main variety all these years. The summer crop was light this year, but much appreciated. With the constant rain from spring into September many plants had 'humidity challenges'. With the strawberries it was leaf spot and the ONS plants looked the worse for wear in that area. So I didn't expect much if any of a fall crop. But as so often happens, I don't give growing things enough credit for their ability to take care of things on their own. In later August I noticed some very nice ripe strawberries. And about every week since I was picking a small basket of some of the nicest fruit of the season! Every time I'd think that would probably be the last; I'd eat some fresh, cook the rest and mix it with the applesauce we have every morning for breakfast (with oatmeal) and we'd appreciate anew the added flavor of the strawberries. Then another week and there they would be -- more ripe berries. The harvest is getting smaller but the appreciation is getting larger! And I think we'll be getting a few more in spite of some very cold freezing nights. This is truly a hardy soul of the old north sea. There is no one "right" variety. Taste, color, shape, size preference -- all are an individual choice. Climate and your soil and ecosystem certainly enter into the picture, as does availability. It does no good to yearn to grow Fairfax, if no Fairfax plants are to be found. All the descriptive hype notwithstanding, you won’t know how a strawberry does in your garden and how you like it until you grow it, harvest it, and eat it yourself. Although flavor is, for me, a big factor in what varieties I choose to grow, their growing habits are also important. Are they prolific producers of runners; or are they less "outgoing"? Many of the newer varieties are bred for large growers who manage their plots entirely by machine, and size is often emphasized over flavor. Does that suit what you want? Sadly, these are usually the only varieties available at the local nurseries, and you’re lucky if your choice is more than one. If you have a source that offers a larger selection, treat them well! Do support your local growers, plants grown near to your region have an easier time with transplanting. But look wider if need be. Most varieties put forth their fruit within a particular time frame -- June in many areas, July in my garden. Some are earlier, some later, so growing a number of varieties spreads the harvest over a longer season, though there is much overlap and each year is different. There are also the "everbearers" that will produce a light crop in the spring, then another in late summer or fall. It may be nice to have a small crop of berries later in the season, or it might just not be worth the bother. Some varieties, such as Honeoye and Sparkle, are tall and produce their fruit high on the plant, making them easy to pick and popular with commercial growers -- and birds. Others, like Premier and Old North Sea, hug the ground, nestling their berries low within the plant, keeping them safe from frosts and marauding munchers. Others, Catskill and Dunlap in my garden, are in-between. They each shine in different ways and in different years. Occasionally you’ll have a year when every one puts forth with reckless abandon and you find yourself scrambling to find new ways to make use of the fruit. There are also the perennial "Alpine" berries that you can grow from seed. These bear a generous crop of delicious small berries throughout the season starting the second year, and can be a fun option. Their manner of growth is different than the others as they send out few runners and are usually propagated by division of the crowns. No matter the variety, you will want to get your beds in shape first, truly weed free and healthy with organic matter, the same as you do with most garden vegetables. A few years of growing and turning in green manure crops can help. Be sure to get those stubborn perennial plants out (such as grass and dandelions) before planting. Once the strawberrys are established, those "weeds" won’t be very easy to dig out without damaging the strawberry plants. When choosing varieties, consider how you want to grow the plants. As always, there are many options. If you use tiller or plow to manage your strawberry patch, then the common mat system is probably what you will use. The plants are allowed to set runners freely; the "mother" plants tilled under in the fall and the "daughters" (runners) are left for next year’s producing plants. Then their runners fill in the old space to produce the next year’s crop, and the old daughter plants are tilled in. And so on, back and forth. For this system, varieties that are prolific producers of runners are best. A similar system is to grow the current year plants in a wide swath, letting runners go where they want, then transplant the runners to another swath or bed every year or two. The original plot is then tilled, plowed, or turned under, continuing back and forth or around the garden. I do a version of this whenever I move my strawberries, though with more runner control. Transplanting runners, though easy, is a fair amount of work and not something I care to do regularly. You can also grow strawberries in pots and planters or special strawberry barrels if your garden is an apartment balcony or a small patch between house and pavement and neighbors. One fresh sun ripened strawberry is better than no fresh strawberries, though the harvest is rather sparse given the work, and you may find the limited space better utilized. The Alpine berries might be a good choice for this type of mini-plot. PERMANENT BED: Since my strawberries are an integral part of my permanent bed garden, I’ve come up with a different system that works for me. As is often the case, this method isn’t "new" at all. Though I worked it out naturally for myself, I have since read of similar plans in old gardening books. It is no doubt common to many gardeners. The runner habits of a variety makes a difference in the amount of work involved in maintaining my plot, and has a fair say in whether I like a variety or not. Although I will give a good tasting strawberry much more tolerance and fuss than a poor flavored one, I’ve come to appreciate those that aren’t so prolific with their runner production. Thankfully, some of my favorite berries for flavor are restrained in their runnery. My beds are approximately four feet wide and I maintain four rows of berries therein. New plantings with purchased plants are usually established in the spring. If you are using your own or a friend’s rooted runners then you might do this later in the summer or early fall. If you have plenty of plants to start with, simply fill up the bed with four rows, spacing plants 8" - 14" apart. Some varieties will want more space (Sparkle and Honeoye), some less (Premier), while others will be happy with 10" (Catskill and Dunlap), at least this is so in my garden. But you can easily change spacing when you set new runners, after you’ve seen how the varieties grow. If you haven’t enough plants for a full bed, then put them only in every other row, or skip every other space in the row, or leave two spaces between. It might take a year or two to fill the bed, longer if the variety is a reluctant producer of runners, but it will happen. As the plants grow and send out runners, move the best ones to the empty spaces. Run them under the mulch and they will be more apt to stay where you place them, pushing the little plant gently into the dirt. If you need to, you can make simple holders out of pieces of coat hanger or other wire, bent in the shape of a somewhat lopsided N. But be careful not to push the wire down so hard you sever the runner stem. Most other runners are pulled off, leaving a few in case they are needed later. As summer continues so does the fussbudgy part of growing strawberries in this manner -- pulling off runners -- again, and again, and again. Prolific little buggers they are, too, most of them. They WANT to multiply, and really aren’t impressed by your arguments to the contrary. It is a constant but hardly a difficult nor disagreeable chore. As you pull runners you can pull the stray weed. When you are picking strawberries, you can pull runners. When you are walking by you can reach down and pull of that errant little runner, hiding among the mulch or enthusiastically heading across the path. Now some runners are particularly hefty and hardy guys so you have to take care not to pull the mother plant out when jerking on the runner. You may decide to use a pair of garden shears for some varieties, though a two handed approach generally suffices. You don’t HAVE to continually pull runners. You can let them go where they will, setting root where they choose and simply thin them all out at the end of the season. But they do tend to crowd the place, and good air circulation is cheap insurance against many diseases and unhappy plants. Pulling runners off before they root, I’ve found, is easier. Thus the managed strawberry bed develops. Anytime you notice a poorly plant, pull it out and replace it with a runner from a healthy, productive plant. Once the bed is full you can begin regularly replacing old plants with new runners every year or two: every other row, or every other plant in the row, or whatever system suits you and your plants. RENEWAL -- Decide which rows will be pulled out -- let’s say the first and third rows. Pull runners off these plants as usual. Even though you’ll be removing these plants later, if you don’t pull the runners off now, they will put down roots here and there and make the job more difficult. On rows two and four, leave a couple of good, strong, healthy runners per plant, placing them where they are not in the way. Usually if they are on top of the mulch they’ll grow their roots but not get down to anchor in the dirt before you are ready to place them. When the harvest is over, pull the mulch back in rows one and three, then pull the plants out. You can also dig them under with a shovel. I’ve done this, but it is messier and makes it difficult to set the new runners well in the lumpy mounds. Normally I discourage removing a plant or its roots from where it grew, preferring to let it compost right where it is, but in this case it has worked better for me to pull the plants out and deposit them in the compost heap. 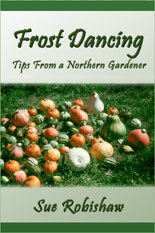 If your garden soil and the plant is healthy, this will not be a casual flip of the wrist. Strawberries develop very good root systems. But a trowel in one hand and a good grip with the other usually works. If your soil is not up to snuff yet and is hard packed, try a shovel or garden fork for assistance. Smooth and firm the soil back in the rows, maybe adding some compost if you have extra. Then take a runner from each plant in rows two and four, run it under the mulch and set it in the now vacant, adjacent row at whatever distance you’ve determined would be best. Firm the little runner plant gently into the dirt, pin if necessary and water. Then pull the mulch back around the plants and let them settle in. You might water them a few more times if the weather doesn’t, but generally there is not much else to do but let them be. The next year or two do the same thing but remove rows two and four. When you remove the old plants, you can also remove those stubborn perennial weeds that become established in spite of your best efforts. In this way you can maintain your strawberry bed for a long time. MOVING -- To move your bed, let healthy runners set root in convenient spots between plants or along the edges of the bed and let them root. If you set early runners, they can usually be severed from the mother plant and dug and transplanted to the new bed that fall. Or do it early spring. I’ve also set the runners into small clay pots full of soil, nestled in among the plants and mulch. It’s more work, but might make it easier to move them a distance. Be sure to keep the pots watered if nature doesn’t, they dry out easily. If you are going to ship rooted runners to someone (which you only want to do if you have good, clean, disease-free plants) carefully pull the little plants from the soil and pack them in a plastic bag. Don’t let the roots dry out. Moisten if necessary but don’t sog them. Put the whole plant in, leaves and all. Send them in a sturdy box, not an envelope where they could be crushed and smushed in transit. Best to ship during a cool season, not during the heat of summer or freeze of winter. Plant or heal-in received plants right away. 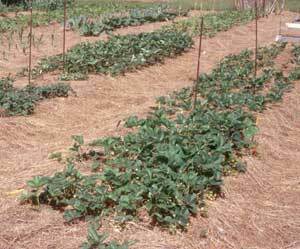 MULCH -- Most weeds will not be a problem in the strawberry patch because of the generous layer of mulch you are maintaining (you ARE mulching, aren’t you?). I prefer hay, weed-free of course, and if possible loose, not baled. This won’t be an option for many, but if you can get it, it is wonderfully nice to work with. When we cut hay for mulch in the summer, I make sure I leave a good pile for late fall mulching of the strawberry patch. Left under an apple tree, it does double duty of mulching the apple tree meantime. In late fall, when the temperature is staying regularly below freezing, I spread a generous blanket of mulch over the strawberries. If I’m short of piled hay, then I pull some up from the paths to cover the plants. 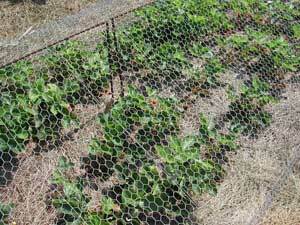 The paths don’t need the protection over winter, but the strawberries might. 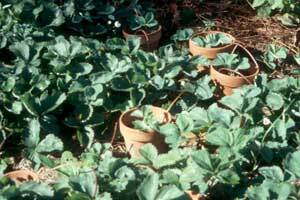 Most winters our strawberries, and other perennials, get plenty of protection from snow and don’t need the covering. But some years the cold comes but the snow doesn't, the ground freezes deep, and many perennials and young trees have a hard time of it, including little strawberry transplants. And this is sure to be the year I transplant a lot of transplants into new garden beds in the fall and am in a hurry and short of mulch to cover them adequately so ... . Oh well, lesson learned. Now I always mulch the little critters. In the spring, when the plants underneath their protective covering start growing and calling for sunshine, I pull the mulch off the tops and tuck it around and between the plants. And that pretty much takes care of the weeding and the need to water. If your soil is not well drained or doesn’t hold enough moisture under the mulch for healthy plants, then work on your soil. Holding a hose over the plot every week splattering cold water over the plants is a poor alternative. And not particularly pleasant for the plants I would think. Trust nature and the plants -- they really DO know how to do it. PROBLEMS -- There are many diseases and insects who live hand in hand with strawberries. If you have healthy soil and give your bed adequate attention, particularly to keeping it comfortably thinned, then you will probably not be troubled significantly with any problem ( not counting the furred or feathered varieties). If you find one kind of strawberry particularly susceptible to a blight or fungus in your area, then grow a different variety. If a plant is doing poorly, then pull it out and replace it with a healthy runner. I have had trouble with diseases and plants "running out" -- plants and berries getting smaller and smaller and obviously not thriving. But it has only been when I’ve neglected the patch and let it get crowded and overgrown. If this happens, you can buy new plants and start a new bed, if you are going to be able to give the strawberries the attention they need. Otherwise, it is an awful lot of work for nothing. But if you have varieties no longer available commercially, or don’t want to spend the money, you can renovate your patch with what you have. I have done this several times with success, though I certainly don’t recommend letting your plants get to this point in the first place. Choose a new bed, free of weeds, with healthy, humus rich soil. Transplant the best looking runners from your old bed, pinching off all but the best looking leaves. 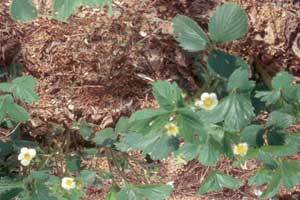 Treat as you would any new strawberry bed, spacing generously, watering, caring and mulching. As the plants grow, pull out those that are marginal and set runners from the best ones. This is usually a several year process of selection, so be patient and don’t reduce your planting to a bare skeleton. If your plants truly are too far infected, then you’ll simply have to start over with new plants. But if you succeed, you have a selection of plants that are particularly resistant to whatever problem they had to begin with. BIRDS -- For twenty years I’d shared my strawberries with the various birds and small furred creatures that live here, with no great problem. I’d come to appreciate the varieties that hid their berries among the foliage instead of holding their berries up and out for all to see -- and eat. I was the only overly greedy harvester. But life is never static. 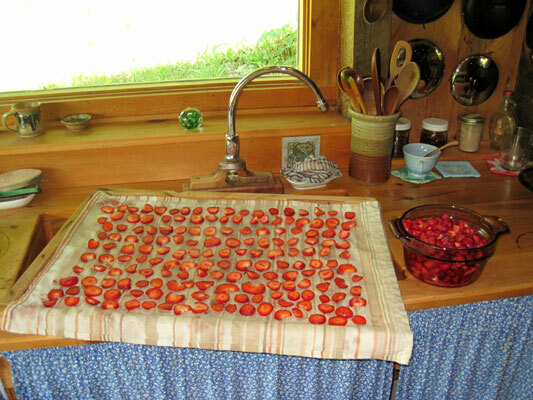 Last year (2004) I was looking forward to one of our best strawberry harvests ever. I had spent many years and untold hours renovating my strawberry beds -- 65 feet of four rows of six varieties of healthy, producing plants. Buds were set, fruit was forming, and on June 24, I picked the first early, delicious berries from the small but wonderfully hardy and prolific Old North Sea plants. A few days later I got a handful. Basketfuls would be ready soon. At the other end of the bed, the more modern, large Honeoye were not far behind. Though not my favorite for flavor, they do produce well and are early. I could see the Catskill and Sparkle coloring up as well. Dunlap and Premier, I knew, would be later. The next day I went out and, to my surprise there were no ripe berries to be picked. Being busy, I shrugged and figured things had slowed down because of the weather and went about my work. It took a few days, but it finally dawned on me that there were not only no RIPE berries, there were NO berries with any color at all. Whenever a strawberry developed a bit of red, it disappeared. Dumbfounded, I stood in the garden trying to figure it out. We had two cats, we didn’t have that many chipmunks and squirrels. The usual array of birds were living their usual individual lives, maybe sampling a berry now and then, but certainly not spending over-much time in the strawberry patch. Then I heard a chorus of short high musical tones -- coming from a flock of birds that I had been enjoying recently as they played and flitted among the apple trees, as only Cedar Waxwings can do. We’d always had a few in the fall, and maybe a few in the spring when the apples were in blossom, but never a resident flock in July. I smiled in pleasant recognition, which turned to amazement, then laughter, as they ignored me and made beelines to the strawberry patch. Certainly no mystery any longer! But what to do about it? I chased them away and realized the solution had to be fast if we were to have any strawberries at all. I didn’t mind sharing, but I wasn’t THAT generous. Nylon netting was out of the question, I simply didn’t want it in my garden. So I enlisted Steve’s inventive self and we soon came up with a plan. We dropped all else and went to work. He scrounged up some 3/8" rebar and headed off to the shop and his torch. I made some phone calls then took off for town to buy several rolls of chicken wire. Back home, Steve cut and bent half loops of the rebar for the ends of the beds, and I folded fencing over them. Long rebar "staples" were placed down the middle of the rows, to stand about two feet above the bed. I cut the 4 foot wide fence into 7 foot lengths, folded the cut ends into a "hem" to make them easier and more comfortable to manage. Then we draped the fencing over the bed, edge to edge, held up by the rebar staples in the middle and resting on the mulch on the edge of the beds. Finally, the strawberries were covered and secure. We went in to dinner. Then I came back out to find a lone Cedar Waxwing inside the cage, unhappily trying to get out. I released him, then rounded up a batch of clip clothespins to pin the edges of the chicken wire pieces together. That was the last bird we had in the strawberry patch until the cover was removed. 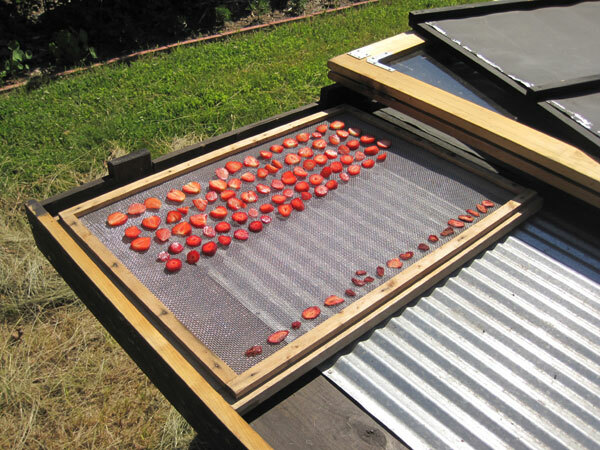 | To work in the bed or pick strawberries, I simply unclip the clothespins and gently fold the fencing back. It wants to slip off over the other side, but a few wire ties at the top hold it in place. When put back down, one has to pull up a bit in the center to bend it back in shape, then reclip the edges. The shorter plants have plenty of room within, but the outer rows of the larger plants do crowd the fencing a bit and any berry within reach is fair game for the birds, which is only fair. We ended up with a great harvest, and though certainly not as easy as an uncovered bed, the chicken wire cage worked quite well. Except that, in addition to keeping the birds out, it also keeps the gardener from easily nipping a berry when wandering by. Sigh. When the bulk of the harvest was over, I removed the loops of fencing, rolled and secured with a rope and stored for next year. The birds happily, and immediately, came in to finish off the last of the berries. So, in the end, we all enjoyed a very good strawberry year. 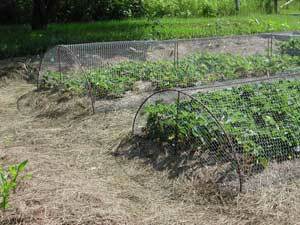 [see "Growing Berries for Food and Fun" for our later, and easier to manage, bird barrier cage. Published in 2016 it has additional info from my additional years of experience growing strawberries, as well as raspberries, blueberries, and grapes]. SOURCES -- Unfortunately, I know of few sources for the older varieties of strawberries now that Walter K. Morss of Massachusetts has retired from the business. If you are interested in other than the usual "modern" commercial varieties, ask around, maybe there is someone in your area growing one or two, and who might be willing to share a few runners with you. The internet should make it easier now to find varieties and sources so do some searching. Though, as I mentioned, I recommend getting plants grown as close to your home as possible. FEDCO Trees, PO Box 520, Waterville ME 04903-0520, does carry some varieties and will hopefully carry more as they come up with other sources (they used to handle Walter Morss's berries). Send for a catalogue or check their listings on their website at www.fedcoseeds.com. They often list different varieties different years, and have good descriptions and a very good philosophy. Trials and Changes: More varieties planted, and more dropped in the last seven years. Catskill because, as interesting an old variety as it is, it never thrived. Plus the berries went from barely ripe to mushy overnight it seemed, though the flavor wasn't bad. Sparkle because it "ran out" after only two years, as it has done for me before. It's a great berry and I like it, but apparently my garden and conditions are not to its liking which is too bad. Honeoye finally came out this year as I admitted that though large and beautiful and productive a berry, it was just plain flavorless. I'd diligently search all over the Old North Sea plot for just one more little luscious jewel to eat before I'd give up and pick some easy Honeoye's. But only for sauce, never to go on the table for fresh eating. All looks, no flavor. Plus it was way too prolific in runner production. Nice strong large plants though. Premier never made much of a crop for me and those that came were slow ripening, soft, and insipid tasting. So I replaced it with some Earliglow from a local grower. Lesson learned here: it's a great idea to buy your plants locally IF the grower does a good job and IF the plants are healthy and hearty. These weren't, and they didn't get any better. Prolific runners and hardly any berries. I'd grown Earliglow before so knew it was an OK berry, but these just couldn't get past their poor beginnings. Sigh. Enough experimenting, time to simplify and settle in. When the clean-up was done after the harvest was over I was left with my two favorite varieties: Dunlap and Old North Sea. I'm happy with that. 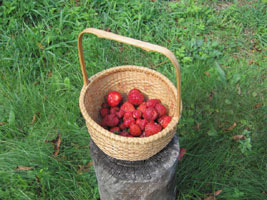 But it has been fun, and many, many nice harvests of delicious berries have been harvested and eaten. My system of renewing one row of the four each year has worked well (plus taking out any other plants that aren't thriving). The plants continue to do well in the patch that was started the fall of 2001. The yearly hay mulch continues to keep the soil rich and moist (even in the drought years) and helps immensely in keeping the weeds out. It's not been that hard to keep those that root pulled and the runners thinned. And the more comfortable the strawberries are, the more I enjoy spending time with them. It's amazing how nice a crop you can get if you give it a reasonable amount of attention and care. And let them do what they do best. The wild strawberries, on the other hand, don’t care what I do as long as I leave their turf alone. They produce, or not, and I can harvest or not. But I partake of their riches only here and there. To harvest a whole bowl-full seems too greedy, and negates some of the magic of the tiny fruit. At least that is my excuse for growing tame strawberries instead of simply picking what is so generously and openly offered in the wild. I rationalize that the other creatures need them more than I do. The "it takes too much time to pick wild strawberries" excuse seems pretty lame when I consider the time I spend on my garden patch. But for those who love and grow strawberries, rationality has no reason anyway. One just does. I currently have six varieties and have tried many others over the years. One variety could do, but if you truly want strawberries, it is hardly adequate. Strawberries are generally considered a northern fruit, though they also dip into the warmer climates. Plants and buds can be susceptible to winter freeze damage, although mulch and snow give them needed protection. The various strawberry varieties have their preferences for soil type and texture. But it does no good to say that the preferred soil is "this", if all you have is "that". 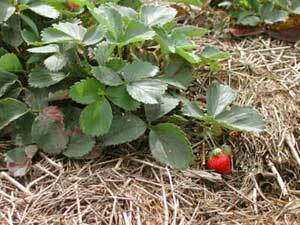 If you have soil that grows green things, then you have a good chance of growing strawberries. Strawberries like sun and dislike overly dry or overly wet. I get a better harvest when my beds are farther away from the woods, where the squirrels and chipmunks thrive and sallie out nearby to dine. A reasonable amount of observation and attention will tell you more than any text what your strawberries prefer in your land. But, as with most plants and animals, people included, strawberries grow best where they grow naturally. Strawberries didn’t do well this year, but I can’t blame it on the weather. I had ignored them the year before and they were all too thick. Finally in July and August I got in there and thinned vigorously. I set runners into small clay pots set in the bed to start new plots. Though this works well, I’ve decided it is much easier to just dig up the naturally rooted runners and transplant directly and not go to the trouble of potting them. They do as well, or better, and you don’t have to worry about getting them planted before they get too root bound in the pots. I decided to drop a few of the varieties I’ve been growing. Fort Laramie because of its blah flavor, although it does produce nice large berries and has done well. But I prefer flavor. Goosecap is another vigorous berry that produces a nice crop but it is too enthusiastic. It’s hard to keep up with thinning the runners. It would be a nice variety for those who manage their crop by tilling, but for my permanent bed, it’s just too much trouble. Lenore is an alpine that I got through the Seed Savers Exchange. A nice tasty berry, it is of the usual small alpine size and I found I often just don’t bother to pick it. So I shall let it go as well. In the fall after the peas were harvested (because that spot was where I wanted one of the new beds) I transplanted the little pots of runners of Dunlap, one of my favorite strawberries for flavor. Then I transplanted Old North Sea among the pepper plants, as the peppers weren’t done yet. In the spring I shall buy a couple of new varieties as well. I set them all in four rows, 20 inches apart, and will let the plants set one runner between, so they will end up about 10 inches apart. I’ve found this to be a good distance for growth and air circulation and to mulch. By managing the runners (when I DO it!) I can keep a good bed going for many years. But eventually the perennial weeds (particularly grass and dandelions) get a hold and it’s easier to move the bed to a clean plot. Maybe I'll do better in the future. I uncover mine when they start looking like they want to grow in the spring, gently pulling off and tucking the mulch around the plants. But since we often get late freezes I'm prepared to cover them back up (with mulch or blankets) if the temps suddenly drop into the teens or 20s. It depends on the variety, but most can handle cool temperatures just fine. A really cold one might damage buds though. Mostly I don't fuss too much with them and I always get berries, but the varieties I grow put their berries low on the plant where they are more protected. How interesting! Unfortunately, my source was Morss & Sons, Mass. who retired in 2005 and that was the only source for the older varieties that I know of. He sent me to Fedco but they, I think , are also looking for a new source for plants. Hopefully they will come up with someone in the future. I would offer you runners, but my plants are not disease free and aren't really thriving. [I later gave up on them as they never did do well]. It depends -- if the plants are smallish I generally pick the blossoms off and don't let them set fruit the first year, if they're larger and hardy looking I let them go ahead and produce berries. Sometimes if I'm busy I don't do anything at all, just let them fruit when they feel like it. It all seems to work out OK.